Yves here. The UK’s post-Brexit “Singapore on the Thames” pretenses should be laughed out of the room. Anyoe who has been paying attention knows that the UK and its Crown Dependencies are already a monster tax haven; pray what more is there to be gained with Brexit? And as this talk points out, there is much to be lost. The EU will be able to crack down on UK financial institutions when the UK is outside the EU that it can’t, or can’t very well, right now. On top of that, Singapore has a population of 5.6 million versus the UK’s 66 million. So even if “Singapore” made some sort of sense, it can’t be scaled up enough to serve as a national strategy. This week the Tax Justice Network’s John Christensen spoke at this event at the European Parliament organised by the European Free Alliance of the Greens on Brexit and the future of tax havens. Here’s more information on the event and you can watch the whole thing here. John spoke on the impact of Brexit on tax evasion and money laundering, offering up some important recommendations on how the EU should move forward in its treatment of the UK, its satellite havens and the City of London. Here are the notes he spoke from, and the accompanying slides. It will come as no surprise that at the time of the 2016 referendum the UK government did not have a clear vision of the type of relationship for trade in financial services they would be seeking with the EU27 once Brexit is finalised. The initial assumption seems to have been that passporting rights could be retained for the UK-based financial services sector and extended to satellites in the crown dependencies and overseas territories. This was the message I heard in the summer of 2016 both in London and the Channel Islands. However, once it had become clear by end-2016 that passporting would not be a viable option, the focus shifted to gaining acceptance of mutual recognition of regulatory standards on the basis of equivalence. Judging from discussions I’ve had this month in London, this expectation of recognition of equivalence of standards remains the goal for post-Brexit relations. I am going to suggest that granting of equivalence should be contingent on the UK and its dependencies committing to and implementing minimum standards on transparency and regulatory compliance, and these commitments are subject to regular – annual – review of their spillover impacts on EU and other third-party states in order to block the UK from engaging in tax wars and regulatory competition. Before discussing this further, I want to raise my concerns about the UK government’s proposals for a Singapore-on-Thames. Senior government ministers have been signalling the Singapore-on-Thames development strategy since January 2017, when Prime Minister May and her Chancellor Philip Hammond both flagged it up as a potential route. Since then other senior ministers, including Foreign Secretary Jeremy Hunt and Home Secretary Sajid Javid, have signalled that this is the model they would pursue post-Brexit. Just to put this in context, Singapore has rapidly expanded its role as an offshore financial centre in the past decade, currently ranks number five on the Financial Secrecy Index, and has a secrecy score of 67. That secrecy score reflects general weaknesses in Singapore’s corporate transparency regime and low level of commitment to tackling corporate tax dodging. So this raises questions about what senior politicians in London mean when they talk about Singapore-on-the-Thames. Mr Javid – a serious contender to replace Theresa May as leader of the Conservative Party, who has worked as a banker in Singapore – has spoken about using tax cuts and deregulation as part of a “shock and awe strategy” to transform the post-Brexit UK economy. Retaining golden visa arrangements to provide residence rights of wealthy non-British citizens, increasing exposure to oligarchs and corrupt illicit financial flows. Of course, none of this is new. The UK set out down the route of becoming a major tax haven economy in the 1950s, and has pursued this development strategy under governments of all complexions. Notwithstanding the commitment to making company ownership information available on public registry, the Companies House registry is under-resourced and the available information is frequently inaccurate, out of date, and incomplete. This presents a major barrier to investigation. Crucially, Britain continues to sustain a spider’s web of satellite tax havens and secrecy jurisdictions which act in a vertically integrated way to block information exchange processes and undermine international cooperation on tackling money laundering. Looked at in isolation, the UK appears to be relatively transparent and fit for cooperation in anti-money laundering and anti-tax evasion programmes. But this is something of a Potemkin village: yes, the UK has committed to an open public registry of beneficial ownership of companies, but in practice the information available from Companies House is frequently out of date, inaccurate and consequently useless. Compliance across the entire financial services sector is weak, reflecting an under-resourced and fragmented regulatory service. Among the many things revealed by the Panama and Paradise Papers leaks, it should be clear to everyone that British territories like the British Virgin Islands, Cayman, and the Channel Islands are intimately linked to the UK through commercial, legal and political ties. They even boast about these ties in their promotional literature. Collectively the provide a complex and evolving ecosystem of laws, regulations and (non)compliance, which undermines transparency and regulation across the world. At the Tax Justice Network we consider the UK and its dependencies as a single entity, with London sitting as the voracious spider at the centre of a secrecy web which spans the globe. Our financial secrecy index reveals that this web is not uniform in its provision of secrecy to non-resident clients. While the UK appears relatively transparent in terms of laws and regulations, the majority of its satellites have secrecy scores which fall into the red zone, making them highly vulnerable to abuse by tax evaders and money-launderers. This range of scores does not happen by accident. London likes to do its dirty business elsewhere, providing plausible deniability for its bankers, officials and politicians. Despite all the promises to be transparent and cooperative, Britain’s offshore secrecy jurisdictions have resolutely refused to make their company registries open to public scrutiny, and some have even threatened to secede if this is forced upon them. 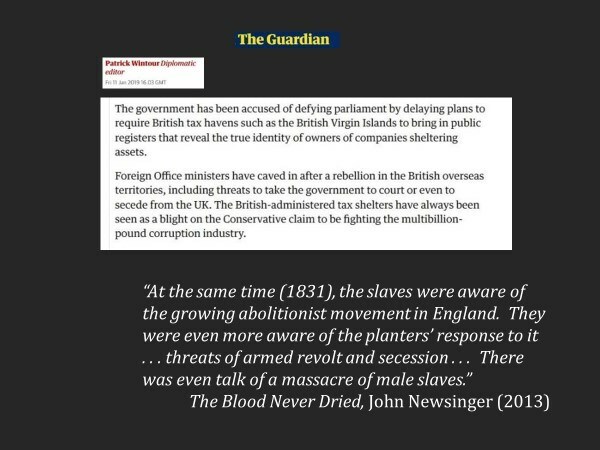 Shamefully, these threats of secession have a historical echo; during the period of huge public campaigning to end Britain’s slave economy in the early C19th, some of the same Caribbean territories currently resisting anti-money laundering measures also threatened to secede in order to protect the interests of their slave plantation owning elites. This month the UK Government has delayed plans to implement a parliamentary decision to require these British territories to make ownership publicly available. 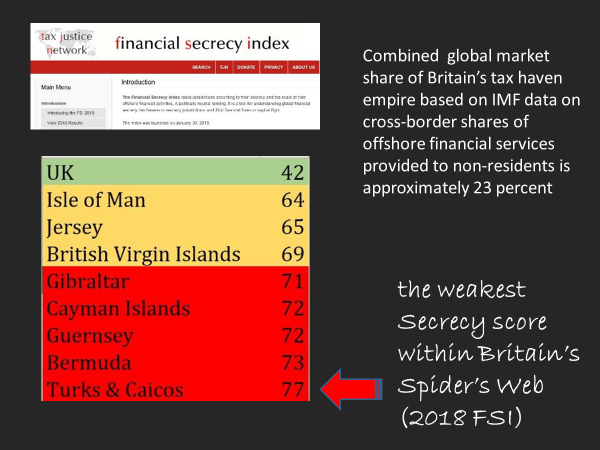 This is why we argue that Britain’s tax haven empire should be treated as a single entity and judged on the score of its lowest common denominator, currently the Turks & Caicos Islands with a secrecy score of 77 out of 100. This approach provides a realistic assessment of Britain’s progress towards tackling tax cheating and money-laundering. On this basis Britain and all of its secrecy jurisdiction territories should be included on the European Union’s blacklist and on every other tax haven blacklist. So what is to be done in the context of Britain’s imminent withdrawal from the European Union? The implication of the Prime Minister’s threat of a Singapore-on-the-Thames strategy is that London will continue with its weak anti money-laundering regime and its support for offshore secrecy in order to attract dirty money from all corners of the world. Its satellite secrecy jurisdictions will continue to resist measures to strengthen international cooperation and make offshore companies and trusts more transparent. And the UK government will be complicit with this refusal to cooperate. In such circumstances, it seems foolhardy for the European Union to grant financial service providers in London equivalent treatment to providers who operate within the Single Market and are regulated under the common rulebook. Put simply, this gives the fox full access to the hen house. Therefore the first of my two principal recommendations is that the European Union should commission a comprehensive spillover analysis of the external risks posed by the British tax haven empire taken as a single entity. This spillover analysis should be conducted by experts independent of any political influence, and its remit should be to provide an assessment of potential threats to the integrity of EU member states on the basis of the weakest points across the entire British spider’s web. In other words, look behind the greenwash of domestic laws in the UK itself and make an assessment on the basis of what international law firms, banks and accounting practices can do in territories like Bermuda, Cayman and the Turks & Caicos. 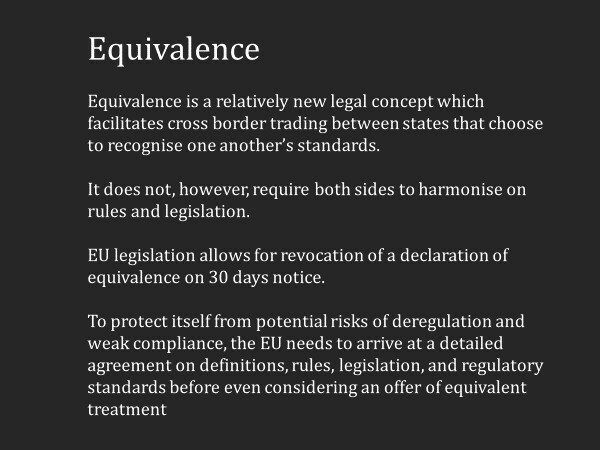 This spillover analysis should inform any decision by the EU regarding the recognition of equivalence of regulation. Until such time as the UK government requires all of its dependencies to fully adopt transparency standards (e.g. public registries of beneficial ownership), recognition of equivalence should be withheld and London-based banks and law firms should be required to operate within the Single Market on the basis of having commercial establishment subject to regulatory oversight by an EU Member State (in compliance with WTO rules on services falling under the mode 3 arrangements). My second recommendation relates to the taxing of multinational companies. The threat of a post-Brexit UK government accelerating the race-to-the-bottom on tax rates and special treatments is clear and imminent. This can only worsen the rise of inequality and the undermining of the capacity of democratic states to protect their citizens. The EU must therefore proceed with its Common Consolidated Corporate Tax Base project and move towards an apportionment-based approach for allocating profits to the countries where they are genuinely. But establishing a common standard for the tax base will not protect individual member states from the predatory actions of a potential spoiler state committed to a Singapore-on-the-Thames strategy. The common tax base will need to be underpinned by an agreed minimum rate, say 25 percent, to block the race-to-the-bottom tactics adopted by tax havens. 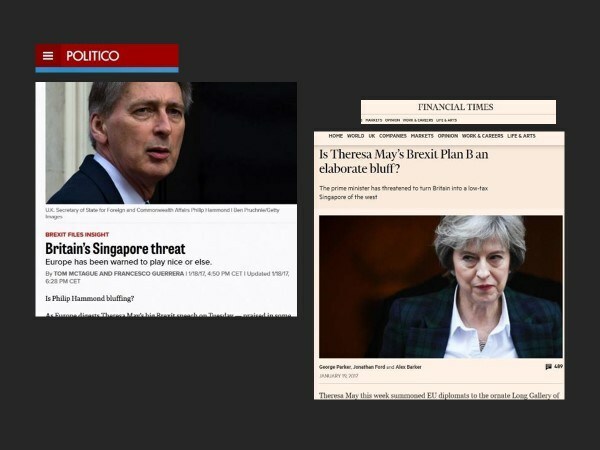 The threat of a post-Brexit Singapore-on-the-Thames places Europe at a point in its political evolution at which it must choose between committing to deeper cooperation, for example on setting a common corporate tax base underpinned by a minimum tax rate, or whether to follow through on the current race-to-the-bottom trajectory, which will inevitably further erode national tax bases and regulatory, leading to slower growth, increased financial market volatility, deeper inequality and social division. So we’re going to pimp this country out to the rich and powerful even more than we do already? It’s a race to the bottom. Leaving the EU should not be used as an excuse to gut what weak labour, environmental & tax laws we already have. Where does this all end? Like this is going to throw the shackles off and we’ll thrive? A once proud nation reduced to selling it’s arse to ‘the mobile rich’. How the mighty have fallen. I have been going under the working assumption that “The City” is just going to be an extension of the Cayman Islands. Retaining passporting after Brexit was always a fantasy that only the most deluded politicians must have thought possible. There was not the slightest chance that the EU would allow a seceding country to retain that type of benefit without a major concession, such as the current complete mobility of people. We seem to be in an age when politicians live in an alternate reality and actually believe their own BS. Please read Treasure Islands. The Caymans are our tax haven, not the UK’s. Leaving the EU should not be used as an excuse to gut what weak labour, environmental & tax laws we already have. Well, for a small but fanatical and well-funded part of the Brexit-pushers this was (and is) in fact a major reason to push for Brexit. it’s not an excuse…this has been going on since the early 1980s. Worldwide, basically. So you can’t isolate it to Brexit. Quite. It is a race to the bottom. But look on the bright side. We are winning ;). That’s been going on for as long as I can remember. I can clearly remember some events from the late ’60s and ’70s. I’m not positive on the details, but I do remember names and dates. One was a complex tax avoidance scheme. The other was sitting in a Stockbroker’s Office listening to phone conversations, which on reflection could have been insider trading. I do remember thinking at the time that investing is Stocks was an insiders’ game – and I did not learn the term “insider trading” until much later in life. When one of my comments is lost it is usually when it took me too long to write it. I believe that there is some automatic tool that takes those comments to limb until moderation. It doesn’t bother me too much. Is a price we must pay to ensure good commentary. What I do is write longer comments in my WP program; then re-read for clarity, continuity, and typos; finally copy-paste to comment box. That’s hard to do on a phone. Typing on a phone must have been conceived by someone from Hell. Equivalence = It’s my party and I do what I want to. For articles like this one this is my preferred site for information. It continues to amaze me that the foreign policy implications of Brexit are hardly spoken about. For instance, the situation now is that our membership and Spain’s membership of the EU effectively rules out any change in Gibraltar’s status. As soon as the UK leaves the EU the 27 will be duty bound to side with Spain in any negotiations between the UK and Spain. Ooops. As soon as the UK leaves the EU the UK will be surrounded, for the first time ever, by a foreign power. Now I recognise that one of the EU’s crowning glories is the fact that, unlike my father’s and grandfather’s generation I have not been given a uniform and had a weapon slapped in my hand and sent to fight in foreign fields. Things can change within the blink of an eye. Peace is always a fragile thing. I believe that leaving the EU is a deeply unfriendly act. It will sour relations between ourselves and our closest neighbours no matter what people say now. tax haven industry. This will be a potent source for EU-Uk conflict. The Lancaster House speech was already a hostile act- give us what we want or we will use no deal to inflict economic harm on you (regardless of the consequences for us). From this simple fact, the EUs defensive posture flows. Shades of the Opium Wars. Except the relative power of the parties is reversed. Serious question: Don’t a lot of Brits want to be rid of Gibraltar the same way they want to be rid of Northern Ireland? Just a bad memory from the Empire. I just had a vision of a future Great Britain that consists of England (perhaps minus newly independent Cornwall and Northumbria) and the Faulkland Islands, the one overseas territory the Conservatives will never part with. I think that some in the ERG pray for the re-conquest of India before they go to sleep. Not enough press time is devoted to what happens after Brexit. It’s not clear to me as to why. I think if there is one particular good global outcome from Brexit it is that the UK is no longer the ‘cuckoo in the next’ in the EU sabotaging any attempt to come to grips with tax havens. The banks will fight hard, but the balance within the EU now will be much more in favour of more regulation. The other beneficiary will be sustainable agriculture – the UK has long played a malign role in sabotaging EU regulations aimed at agriculture. I don’t know enough to form an opinion, but might it not be the case that the EU allows offshore centres of it’s own by turning a blind eye to Luxembourg? Or maybe allowing the creation of a shadow “structure” in Frankfurt or Paris or perhaps utilizing such structures that already exist in countries that are close to the EU such as Liechtenstein or Andorra? At the same time they may well blacklist the City of London connected centres. 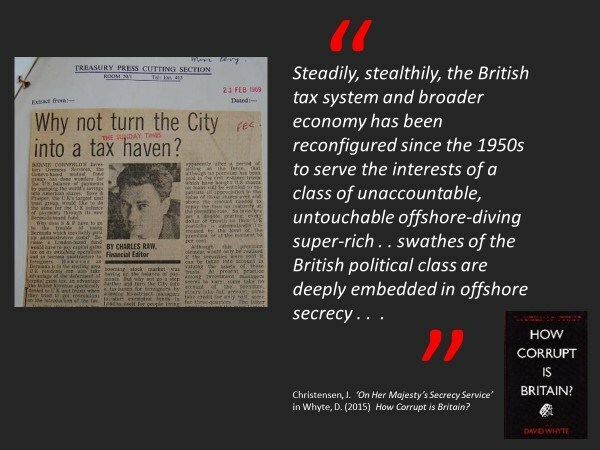 I think already the City is effectively the biggest offshore tax haven in the world with it’s connections to the Caribbean/Channel Islands. so would the EU not attempt to take some of this business? It seems to me that holding on to people’s ill gotten gains is a good way of blackmailing them to not be your enemy. But like I said, I don’t know enough to form an opinion about how the EU might play this out with regard to offshore tax havens. I think it very much depends on the nature of the offshore centre. Luxembourg is to an extent a small fish compared to London and Switzerland – its where German small businessmen go lodge their ‘under the counter’ takings. A lot depends on who the off-shore centre is hurting, and this is where the overall balance of power comes in. I have a gut feeling that without the UK at the table the balance of power has swung against the worst excesses of the off-shore game, although it will always be in the interest of some power players to keep some open – but places like Monaco and Luxembourg will be favoured, not London and Switzerland. But thats just a guess, there are others here who would know a lot more than me on this subject. And where all the well off Belgians I knew took their extra money (I didn’t know any millionaires, as far as I know). This paragraph is important: “Just to put this in context, Singapore has rapidly expanded its role as an offshore financial centre in the past decade, currently ranks number five on the Financial Secrecy Index, and has a secrecy score of 67. That secrecy score reflects general weaknesses in Singapore’s corporate transparency regime and low level of commitment to tackling corporate tax dodging.” So Singapore is already wallowing in corruption. The list in the screen capture of various off-shore dependencies (Channel Islands) and pseudo-colonies (Bermuda) is well known. When I looked at that list I thought: Do the English truly believe that no one in the EU could figure out that they were running this scam? And now they want to be saved by “pimping out” (to use the words of other commenters) Guernsey and Jersey even more? What do they envision? French people in overladen boats crossing from Normandy to shovel euros into the banks of St. Helier? And yet, I see the U S of A thoroughly intoxicated with similiar fantasies. So this isn’t a barb at the English. Après Brexit, les Etats Unis. Are the Channel Islands, and the Isle of Man in the EU? I was under the impression that the Channel Islands were not in the EU. The legal regime seems to be (fictitiously) half in and half out, now verging on all the way out. Why would the Channel Islands implement only certain of the EU laws and regulations? You are closer to the scene and may be able to judge better. I don’t think there is a single general answer, but it is quite fun to read the annexes to the European treaties to see where they apply. So some texts may apply into the Pacific Ocean (where France and UK have territories), or may apply into the French territories of Latin America, but not the Dutch ones, or vice-versa. And likewise, Channel Islands may be included or excluded from the treaties. It sounds like the UK is the proverbial backdoor where all sorts of illicit funds come through after being laundered by their “Treasure islands” and from there straight into the EU. If the EU shuts out the City of London, this might give an impetus to reshuffle financial regs on the continent that would not have been possible if the UK had remained. PK mentions agriculture as another area where change may take place. I would suggest too foreign affairs where the UK has been deliberately sabotaging EU relations with countries like Russia. I wonder what would happen if any funds from the UK had to prove their provenance from their original source and not just some PO box in the Caymans? The illicitry of it all leads to Shacks-on-the-Thames, downstream from those Singapore pretensions. If the British people can learn fluent Chinese and they could move the British Ilse within 1000 miles of the Chinese coast, this methodology has a legit shot. Alternatively, if Russia becomes the next China, they could forgo moving the entire Island and just provide crash courses in Russian for everyone. Gotta think out of the box here. Mr Javid – a serious contender to replace Theresa May as leader of the Conservative Party, who has worked as a banker in Singapore – has spoken about using tax cuts and deregulation as part of a “shock and awe strategy” to transform the post-Brexit UK economy. This sounds very like the policies enacted in my US state when a libertarian ideologue wing of one party was voted into office. The results were a disaster for the state. The word ‘Disaster’ in this case is not hyperbole. Economic activity went down, public k-12 schools had to close out the school year several weeks early due to lack of funds; spending for public health and child welfare was drastically cut; cities and municipalities lost revenues used for road maintenance and other public goods roads and bridges were not properly maintained. It’s a very long list so I’ll stop with these lowlights. A very very few people and LLC companies got very much richer. Everyone else got poorer. Sales tax, even on grocery story food, was raised; deductions were reduced, property tax was raised, user fees were increased, all to try to fill the hole created in state funds. Business activity did not increase. New companies did not move here. Companies want to locate in areas with good schools and roads, civilized areas. In fact, the state lost 2 very large, old established companies to other states. I’ve seen this libertarian ‘religion’ in action, it’s not a pretty sight. As an aside: Is Jacob R-M the son of Willian R-M, author of ‘Blood in the Streets’ and ‘The Sovereign Individual’ ? JRM pronounced Germ and WRM pronounced Worm. Am I right? Are they pronounced “Germ” and “Worm” ? Mirdif beat me to it. Like minds. Yes, The seed has not fallen far from the Tree. Oh dear, sounds analagous to Bush and Bush with Iraq. Why is it that the needs of some sons to prove themselves to their fathers is allowed to have such devastating effects on so many other people? Sounds to me like a good reason to have some sort of international anti-dynastic laws. Assad father and son in Syria is another recent example. This is an interesting article. The thing that strikes me is there is this big blank spot in the coverage where the 50 most powerful private oligarchs in Britain could have no opinion on the Brexit issue for all the little folks know. And the unspoken truth has got to be they are all for it. The closest I have heard from is Murdoch and he is Australian and not one of the 50 but he is all for it. I am thinking the Queen must be in complete agreement with Murdoch; the probability has got to be at least 90 percent. This analysis is almost perfectly parallel to the one Webster Tarpley had on the Guns and Butter podcast about two years ago. It is geopolitical. They see the United States hegemony has to end at some point and they look at the current strategy of the British state as being an American toadie. There is another kook (make no mistake about it Webster Tarpley is a kook and it is telling some of the commentators making the most sense are kooks; where in the heck are the professional opinion leaders like BBC and Economist and FT?) who says the long term plan for the British mass is the British Navy is coming back big time as a security detail for the Saudis and the Chinese and the Iranians and the future is keeping the Strait of Malacca clear for oil tankers to China. He has nifty powerpoints so if you are a visual style thinker this is probably better than the Tarpley spiel. Anyway Christiansen’s text is a lot faster and I have not seen this angle anywhere in the major press so thanks! Yves Smith: Many thanks for this post. And it isn’t just that it confirms what I already suspected. I recall that you kept reminding the commentariat during the Greek negotiations that the new drachma was not a viable option. I think that these fantasies of buccaneer banking are at the same level as the new drachma. Financial fantasies. Yes, the UK has retained its own currency, whereas the new drachma was an attempt to secede from the euro–but fantasies nonetheless. Apparently, this fantasy has the support of more oligarchs…globally. And elected and appointed officials have a harder time sying no to them than Greek workers. This is bold piece of straight talking analysis. Where has this information been? Richard Murphy has been speaking about it, but few others. 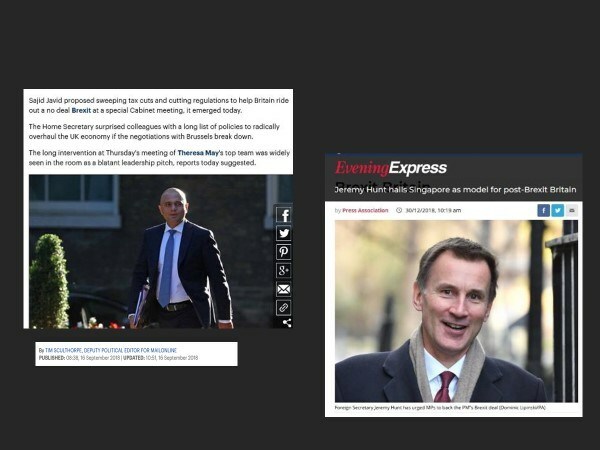 And for the EU to almost be playing along as Theresa May bluffs her way into a stealth British civil war – (another example of the current choice of non-violence?) – is almost as disconcerting as May’s empty speeches… If the UK crashes out it will be so chaotic that all the black banking in the financial empire of the rich Brits will find new safe havens. It’s a war on the British people first and from there a war on human equity starting with the next most vulnerable – the people of the EU. I hope the British come to their senses in a blinding flash, this whole Brexit scheme was a con game and they were the mark. I’d be nervous for the little kids that idea might be taken further than banking. Kind of like The British East India Company rises again (though the influence never left). If the UK leaves without a deal (as now looks likely) the EU will force the Government in Eire to install a hard border, presumably using similar threats to those applied to Greece. This will cause the de facto united Ireland that we currently have to be partitioned. What, I wonder, will the reaction be in Eire to an instruction to “reform” its tax situation at the same time? The UK will also be installing a border in the case of no deal due to WTO MFN principle. Failure to have border controls at one border automatically means no border controls anywhere under the MFN principle otherwise complainants will be filing disputes with the WTO DSM. The US is particularly prone to filing complaints at the WTO so I wonder how quickly they’ll do that if border controls are not installed by either side. Also, with regard to the pressure applied to Greece, I take it you were in favour of giving British taxpayers money to bail the Greek government out of its problems. A noble stance though I doubt a majority of British voters would have been in favour of that. Francis Fukuyama wrote a widely heralded book in 1992 – ‘The End of History and the Last Man’ . It was, let us say, like so many literary tomes, both flattering to its time’s political hopes and deeply misguided. imo. Fukuyama failed to recognize or account for the neoliberal (not liberal) capture of western govts. This raises a question for me: how did London get away with being a tax haven INSIDE the EU? Isn’t the Union supposed to be rather tightly regulated? It’s almost as if the European PTB WANTED a tax haven. In that case, London might just get away with continuing to be a tax haven, only under different legal arrangements. I don’t think the constantly strained French, German, and other exchequers would be pleased with that, and there will certainly be a measure of payback for Brexit. The deal with the UK was that it made big contributions, a kind of quid pro quo in effect, and also, even though this laundering business had a history before joining the EU, it exploded under Thatcher and her successors long after the UK had joined..
ps There will continue to be tax evasion for sure though I’m sure the EU will be far less tolerant of an ex member in this regard. I believe the principle: “They may be spivs running a tax haven, but they’re our spivs” might have been applied to the UK for the previous few decades. The EU was reluctant to allow the UK in (remember, it only joined on its second try, the previous try was vetoed by the French), precisely because of worries about the City. And the City only really became turbocharged in the 1980’s after deregulation, and after it joined the EU. Full regulation was always impossible once the UK was in as it could veto any Directive it didn’t like. The EU has always been split over the role of London. London provides very important financial services to Europe, but has also been a drain due to its weak regulation, I don’t think you’ll find a consensus in the corridors of power in the EU as to whether these balance each other out. Most European countries don’t ‘want’ a tax haven in the sense that places like Monaco, Switzerland and Luxembourg have provided that service to their own rich without being too destabilising. And countries like Ireland, Luxembourg and the Netherlands have provided favourable taxes havens for companies with a large base in Europe within EU rules. I thought it was the third. Didn’t Wilson have a go? I wish they would pick the positive features of singapore such as the top public housing and excellent urban management. The article connects Singapore with a lack of financial transparency and then says that it follows that uk will become a tax haven. How the hell does that logically follow? How about we strive to create a clean, crime free, futuristic country like Singapore? Singapore is built on free trade. Why not? Deregulation there hasn’t been a race to the bottom, it has created one of the most wealthy and amazing places on the planet where wages are higher than those of the colonial master. Hell Singapore has massive immigration. Why not? Sure there are bad things like old poor people working until they drop, but anyone seriously think the large number of old people in uk will vote for that? This article is designed to generate discord and judging by the comments it had succeeded. Some people only see the negative in everything. Makes about as much sense as Clinton and Gore claiming they could turn the US into Luxembourg West.